Heat a pan with a little of the oil. When hot add the sliced chorizo. Sauté until they start to release their juices. Bring two pans of water to the boil – one with a dash of white wine vinegar and the other with a good pinch of salt. Place the asparagus into the pan of boiling water and salt for approximately 2 to 3 minutes, until cooked, but still with a bite. In the pan of water and vinegar – soft poach the eggs. 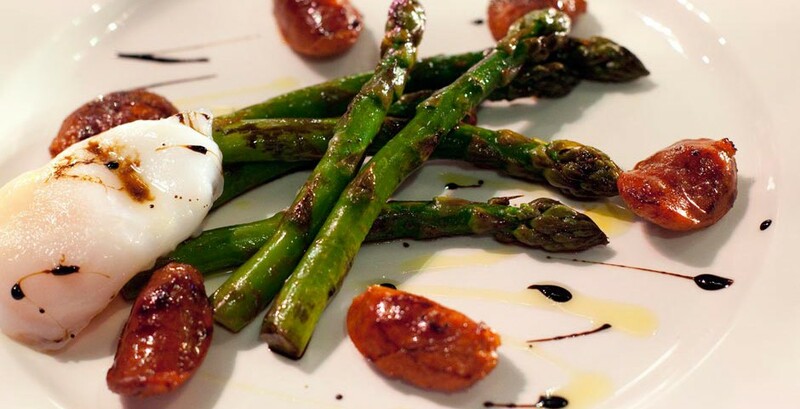 Place the drained asparagus onto a plate, place the cooked chorizo on top, then the poached egg. Drizzle with a little olive oil and serve. If you’re not sure how much to cut off the ends of your asparagus, simply bend them slightly and they will snap. Duck eggs taste very similar to hens’ eggs but the white has a firmer texture.